Yeah, I know. Two Beer Fest blog entries in a row, but I guess it's Oktoberfest season, and a good reason to invite people to drink beers. Last year's Beer Fest was great, although the weather was rainy. So rainy, in fact, that everybody huddled within the long beer tent to keep from getting soaked, making the place seem a hell of a lot more claustrophobic than it should have been. This year's Beer Fest was better. The weather was cool but nice--typical NH autumnal weather when it's not raining. There were probably even more people than last year, but with people willing to be outside of the tents, it felt a lot more roomy! I'm not sure if this was true last year, but this year, all the beer vendors were arranged in alphabetical order, with Alligash the first one as you entered, and Widmer Brothers bringing up the other end. All the microbrews in the region (with some exceptions) were represented (C'mon, Harpoon! You can have your Oktoberfest thingy some other week!). There were even some from out of state--California, Boulder Colorado, and even Kona in Hawaii. 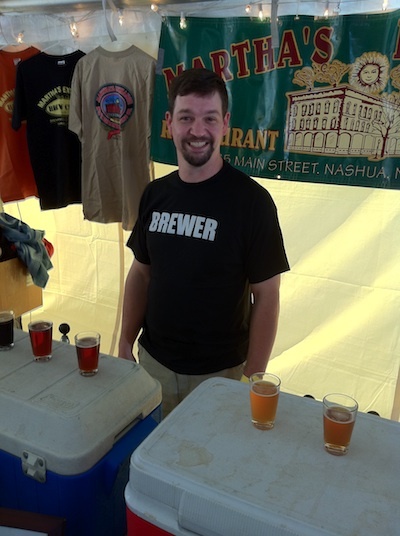 My first visit was to Greg Oulette, the brewer for Martha's Exchange in Nashua, NH. I've known Greg since before he was at Martha's (he worked at Incredibrew and some of his recipes are still there). I had my first--and, arguably the best--beer from Greg's table, Dr. Hoppenstien's Double IPA that was spot on for taste and bitterness. My next taste was one that I had only a teasing sample from at the Nashua Beer Fest... Widmer's Drifter Pale Ale. This had a lot of flavors I don't normally associate with pale ales, but it works. I can't wait to find it at my local store. One beer hit me as kind of special. It was Taint Town Pale Ale from Kennebunkport Brewing. They had it on draft and in cask. I had the cask version, and instead of the bold hoppiness I expect from Pale Ales, it had more floral overtones... like smelling a bale of hay that had been left out in the rain. The taste startled me at first, but by the time I finished it, I knew it wouldn't be my last taste of that cask full of nectar, and I had a refill. Like last year, the Beer Fest had two sessions, from 1-4pm, and from 6-9pm. The first session, though, also had a special "VIP" session from 12-1pm (for an additional fee). It let you get into the Beer Fest an hour before the teeming hordes. I so enjoyed my first hour at the Fest that it wasn't until about five minutes before one o'clock that I noticed there was a bunch of people waiting outside the beer tent waiting to come in. And by a "bunch," I mean QUITE A LOT OF PEOPLE! When the hour chimed, the little plastic fences were taken down, and the cozy, comfortable "almost one on one with the brewers" feel of the place was replaced by long lines of people wanting to partake of the brewers' tasty wares. I'm happy that Red Hook, Prescott Park Arts Festival, and WHEB have decided to revive the NH Beer Fest last year, and appear to be set in making this an annual event again. This used to be sponsored by the old (and, unfortunately, apparently no longer a beer-brewing company) Nutfield Brewing Company at their headquarters in Derry, NH (as well as one or two at Strawbery Banke in Portsmouth). I miss the old event, but the new one is taking up the slack very nicely. Next Saturday, Prescott Park Arts Festival is having a Chili Cook Off event at Strawbery Banke. Although the chili will be free with admission, Red Hook will be there selling a few of their beers to help quench the bowls of fire that will be on offer there. If you're in the neighborhood, I hope to see you there!